I’ve been trying to think of a way to start this review, give it the requisite oomph and pizzazz to get you enthused about this new movie, or at least interested in reading about it, but I’ve got nothing. After all it’s another instalment of Sengoku Basara, the anime adapted from a beat-em-up video game, which turns historical characters from the Warring States period in Japan into larger than life videogame combatants, complete with special moves and corny catchphrases. Manga Entertainment have released the first two series in the UK, and now they bring the feature film adaptation to our shores. For me the first series had some novelty to its over-the top characters, and earth-shattering visuals, but that novelty wore off when it came to the sequel. It’s hard to begin a review with enthusiasm when enthusiasm for this franchise is one thing that I sorely lack. Incidentally, you may see a little inconsistency on your shelves at this point. Season 1 was released in the UK on DVD and Blu-ray, but poor sales of that initial Blu-ray meant that Season 2 was a DVD only release here. Now that The Last Party feature film has arrived, we’re getting DVD and Blu-ray again. For the purposes of this review though, I’m taking a look at the DVD. It’s the Warring States Period, with warlords from all over Japan vying to be the most powerful in the nation, become that man who unites the country under his banner. Of course with everyone applying for the job, it really just results in mayhem and chaos; as soon as one dares to stick his head above the others, they all compete for the opportunity to cut it off. And once in a while a man of unspeakable vision and horrific power appears who threatens the very nature of the country itself, requiring the others to actually ally to protect the country. 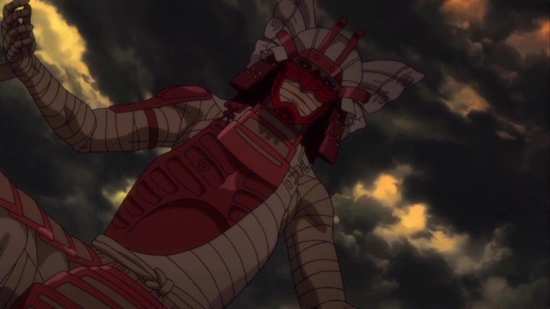 The first season saw the demonic Oda Nobunaga defeated in such a way, and the second saw Toyotomi Hideyoshi destroyed. 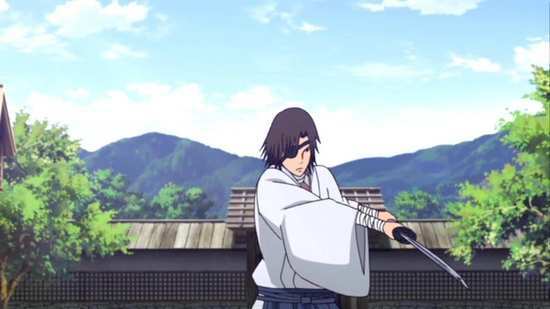 In amongst the carnage, two skilled warriors, Date Masamune and Sanada Yukimura developed a rivalry that transcended both friendship and enmity. 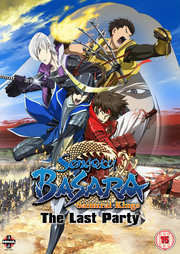 In The Last Party, the war for Japan reaches its final stage, as a new figure appears, Ishida Mitsunari, who doesn’t care about ruling the nation, but he’ll do whatever it takes to obtain vengeance for his slain master Toyotomi Hideyoshi. Meanwhile a new warlord has appeared with a different vision for the future of Japan, a peaceful vision built on trust and respect. 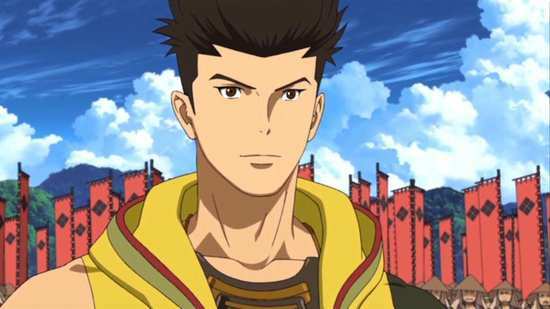 His name is Tokugawa Ieyasu. 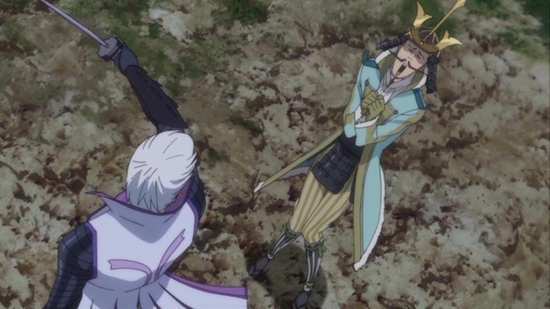 That’s just what Mitsunari needs to get his revenge on Masamune, and using Tokugawa’s name, he invites the battling warlords to a meeting in Sekigahara. But there is someone else waiting for them as well. The Last Party gets a 1.78:1 anamorphic native PAL transfer on this dual layer DVD. It’s clear and sharp for the most part, with smooth animation, and strong vibrant colours. The character designs are pretty much the same as those from the TV series, but the movie budget can definitely be seen in the action sequences and the slightly larger scale to proceedings. A couple of the pans and scrolls are a little jerky, and the disc has an ill-placed and obvious layer change. Otherwise it’s a decent DVD transfer sourced from Australia’s Madman Entertainment. You have the choice between DD 5.1 English and Japanese, with optional translated subtitles and a signs only track. I listened to the Japanese audio and was happy enough with the experience, with the series voice cast returning in their familiar roles, Sanada and Shingen spraying testosterone all over the place, and Date Masamune’s Engrish reaching new levels of cool. There is an initial oddity with the narrator over the recap sequence ahead of the film sounding a little hollow, but there are no such issues in the film proper. The action sequences will definitely give your surround setup something to do, and your subwoofer will be woofing like there’s no tomorrow. I gave Funimation’s English dub a try, and it’s a competent dub that flows well, although the volume is set a little low in comparison to the Japanese track. The Last Party is presented on this disc with static menus, and a jacket picture. For once Funimation chose not to mess with the Samurai Dancing end credits and have instead added a translated English language credit scroll after the film. The disc does pretty well when it comes to extras though, beginning with the Four Panel Theatre: Another Last Party which runs to just over 7 minutes. In it there are five bonus animations of the sort that came with the series, re-imagined scenes from the movie played for laughs. 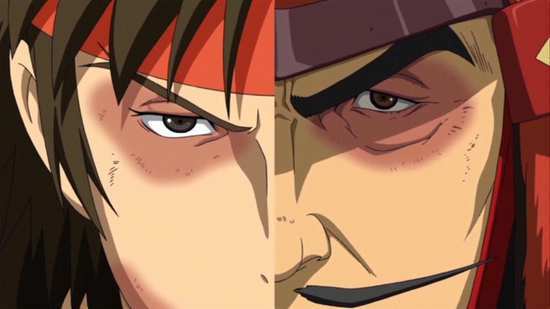 The Making of the Last Party is a pretty comprehensive look at the creation of the film, from the film’s commissioning to its release, and the history of the Sengoku Basara franchise as a whole. It’s the usual behind the scenes look at the animation studio, with lots of earnest Production IG employees at work. Unsurprisingly though, the bulk of the featurette is devoted to the voice cast, given that the over the top dialogue is such a draw. You get interviews with the cast and the crew, and a look at the actors at work in the sound booth. 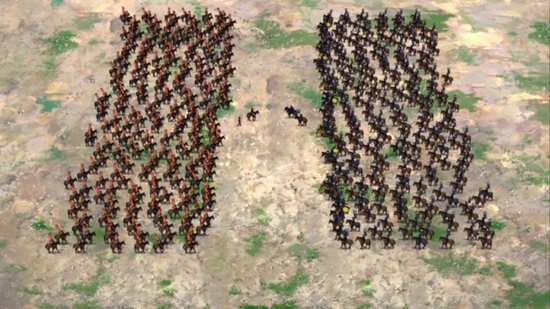 And Shingen vs. Yukimura is just as overwhelming in real life as it is in the anime! This lasts 50 minutes. 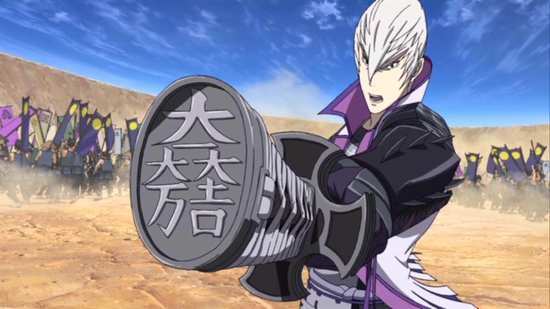 The Trailer and Commercial Collection lasts 8½ minutes, and normally this would be a disposable extra, but for Sengoku Basara, the characters created cinema etiquette commercials to tell people not to be anti-social while viewing the film. Some of these are really quite good. 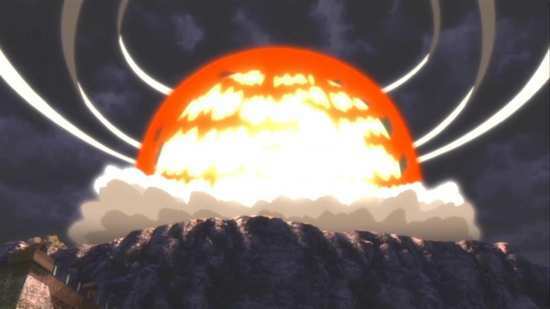 Finally you get the textless credits, which once more in the average anime would be disposable, but here you get the dancing Samurai end credits in full without text! It turns out that my lack of enthusiasm was justified. 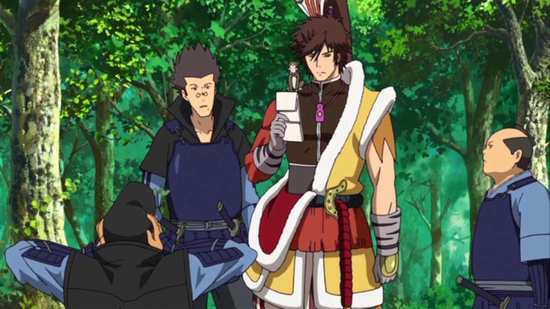 There are certain things that you need to appreciate to fully enjoy Sengoku Basara. You need an understanding of Japanese history, particularly the Warring States period, you need to appreciate over the top characterisations, and battle scenes so frenetic and fantastic that they just beggar belief, and you have to be able to bear a tsunami of testosterone, with manly manliness oozing from every manly pore in every manly man cast in this film. Surprisingly the Last Party is restrained when it comes to fan service. The female ninja in the skin-tight leotard lusting after her effeminate male warlord leader... they hardly get a mention in this film. 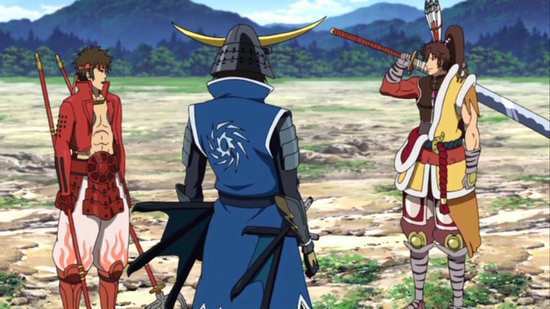 Let’s face it, Sengoku Basara: Samurai Kings: The Last Party is not a movie to take seriously. It’s a movie to partake of when you’re tanked up on lager and kebabs, when you are of a mind to appreciate sheer animated nuttiness, and ridiculous characterisations. I tried watching it sober, and I actually fell asleep during the film’s climax. At least that gave me the excuse I needed to go back and watch that scene over with the English dub (which is pretty good), but really The Last Party is a dumb movie and a waste of time. But you know what? There are times when a dumb movie that wastes 90 or so minutes is just what you need. One to watch with your brain in neutral.